Fraught with fear and the anxiety to fit in, Madhav Jha gets the biggest and unexpected twist of fate at Stephens, he falls in love, with Riya Somani, who is portrayed as the beautiful, rich and sophisticated Delhi girl, who co - incidentally is also a basket ball player. The plot becomes drab with Madhav trying to get her attention, but afraid to open up, while Riya eventually gives him attention - much like the basket ball that passes from hand to hand and you get BASKET!! But Riya is complicated. Very much so. I could not figure out her exact character, nor to be honest, I understood Madhav well. She toys with Madhav, who apparently is constantly horny. The story becomes insightful at places where Madhav reminisces about his mother, the Rani Sahiba, the gap between the rich class and the low class, the impossibility of striving in this nation without good English. Good pointers, Mr. Bhagat. However, Riya Somani, after spending ALL of her time with Madhav, decides that she cannot be Madhav's girlfriend (friend-zones him) and offers a compromise - to be his Half Girlfriend: Meaning I-will-hang-out-with-you-but-we-will-not-do-any-of-those-things. It gets whacky when Riya Somani suddenly disappears and Madhav makes his way back to his village - to turn the fate of his mother's school. At this point the story becomes very engaging, though I must tell you that we Biharis don't eat Litti Chokha all the time! What comes in for Madhav next is an opportunity to meet Bill Gates, learn English (courtesy Riya Somani) and find his life upside down, when he thinks that finally things were on track. The chase for love begins and the character of Madhav grows but I feel, certain things were rushed which could have made great impression if they were given a time to develop. 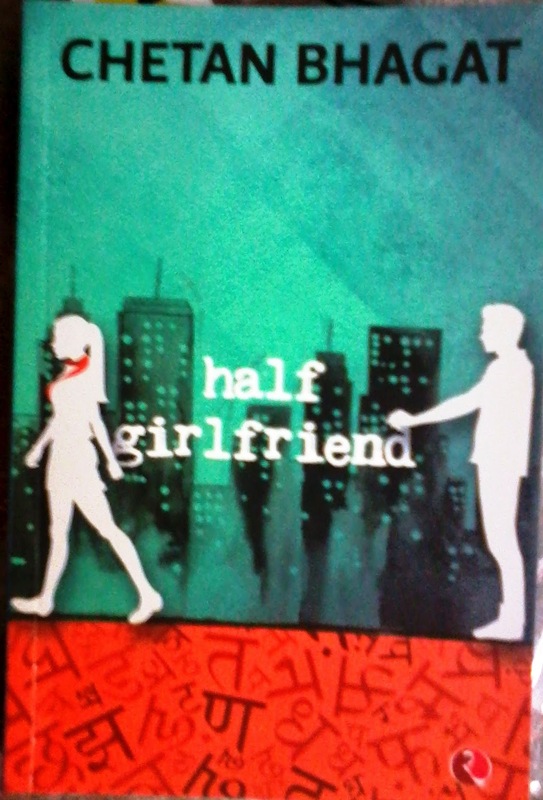 For me Half Girlfriend was more like Forrest Gump meets Queen meets Jab We Met plus a flurry of movies that came to my mind while reading. BUT! You can finish the book quick and it will leave you with light heart (and head) and an impression, that even Chetan Bhagat has matured somewhat as a writer that the masses love.